ROCKiT space, the community music and art organization located on Beacon Avenue, is having their First Birthday Party tomorrow, November 6, from 12 noon to 12 midnight. They promise “family fun from noon to 6:00 pm,” including “SquashFest,” face-painting, music, games, and prizes. Grown-up fun (but kids are welcome) follows from 6:00 pm to midnight with more music, games, prizes, and surprises. 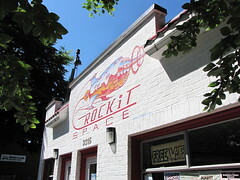 ROCKiT space is at 3315 Beacon Avenue South in North Beacon Hill. Thanks so much for the shout out Beacon Blog! We had an amazing party. Beacon Hill, you are the best!! !